Come on in, the fire's warm. Photos by Kim VanderVoort. Spring may be just around the corner, but winter's not gone yet, and neither is the urge to hibernate. 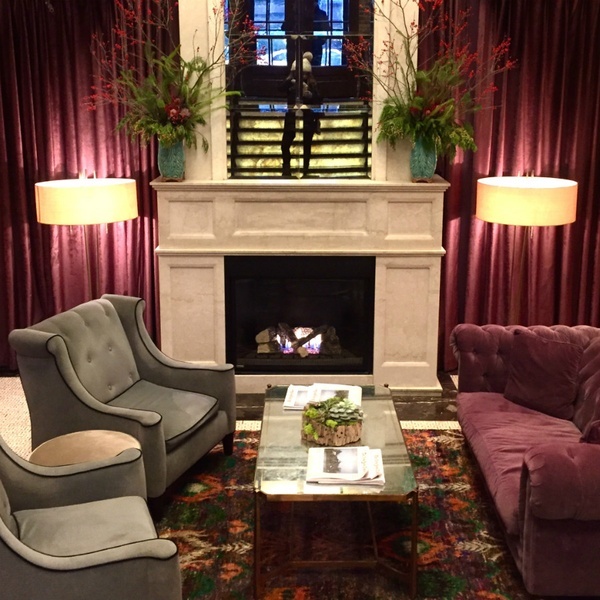 Popupla's Kim VanderVoort holed up in the refurb'ed Walker Hotel in New York. NEW YORK CITY – There comes a moment each year when the only answer to a New York winter, with its biting wind tunnels and slush puddles so vast they've become dignified Bodies of Water, is a swanky establishment with a liquor license and a fireplace. This year, the impulse came over me faster than you can say "MTA delays." Before I knew it, I had booked myself a staycation at a nearby hotel that promised a little hygge. What better cure for mid-winter gloom than a fireplace? Two! The answer is two fireplaces. My hotel of choice: the recently renovated, née the Jade Hotel, in my very own neighborhood. It was the kind of place I've walked by a thousand times, each time thinking how nice it would be to stay there, but resigning myself to the likelihood that I never would (which made it all the more satisfying to book my stay). 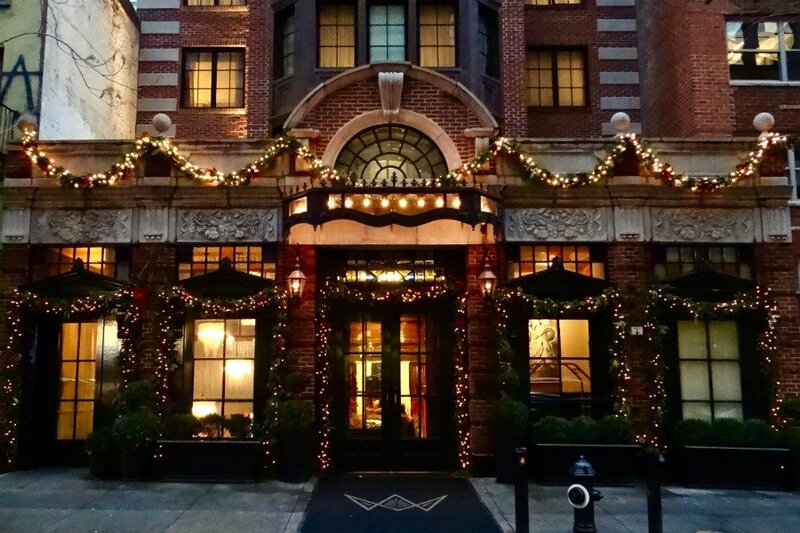 When I arrived, the facade, strung in near excess of garland and twinkling lights, conjured some of the magic the city held for me in my teen years, back when everything about New York was still electrifying and romantic and possible. The entrance was grand. Two doormen opened the cast iron double doors and I stepped down a widening staircase, which lent an air of elegance to the cozy lobby, where mauve velvet abounds and the first fireplace beckons. It felt more like a lounge than a lobby: While I was checking in, a few groups sipped luxe cocktails around cafe tables behind me. My room was just as swanky, albeit small, and furnished with custom-designed Art Deco versions of all the usual suspects: queen bed, armoire, desk, armchair, mounted TV. The hotel is in the middle of the block facing other similarly tall buildings, so my view was nothing to write home about, but neither was the room begging for one. 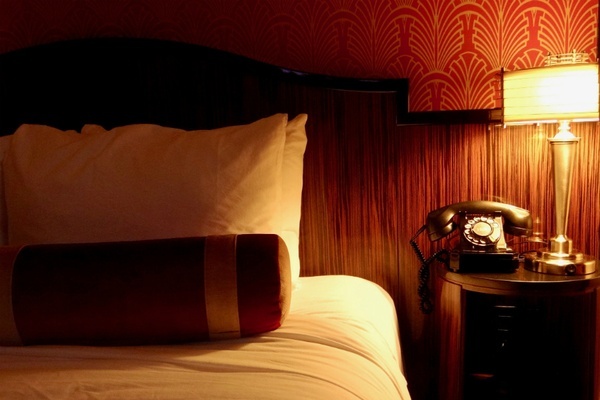 I drew the curtains and relished in the dim lighting while I played with the rotary phone next to the bed, which, I realized a hair too late, was a completely functional phone capable of dialing all sorts of hotel extensions. When the front desk picked up, I blushed. I would have stayed curled up in my homey little room were it not for the reservation I had made at downstairs , where I was greeted by teal banquettes, antique mirrors, walnut finishes, a friendly staff, and (behold!) the second fireplace. 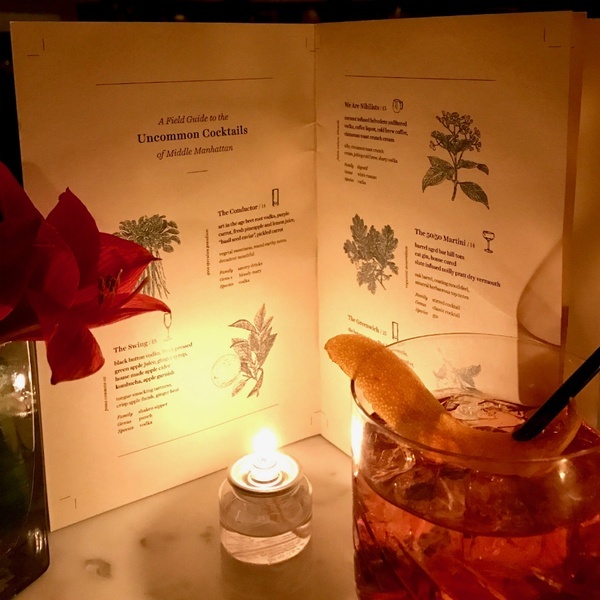 Perusing “A Field Guide to the Uncommon Cocktails of Middle Manhattan” (the drinks menu), complete with sketches of herbs and plants and family-genus-species-style descriptions, I welcomed the gimmick. I felt like a regular botanist. Chef Christopher Zabita (Bar Bouloud, Marc Forgione) sources his ingredients from the farmers and purveyors of nearby Union Square Greenmarket. The menu changes seasonally, and if my sumptuous Hudson Valley “PB&J” foie gras and South African Wagyu rib were any indication, each iteration will be grand. Alas, my sojourn was brief, but it was exactly the warm respite from the outside world — with its gray skies and endless to-do's — that I needed. My dear friend, the rotary phone. I didn't need the field guide to know I wanted a negroni. Greenwich Village, near Union Square. Up to date with some well-placed old-school Art-Deco touches. I loved the old-timey touches, like the bedside rotary phone, the dial radio on the desk (fear not — it has bluetooth capability), and black-and-white subway tile in the bathrooms. NYC anti-tourists looking for a chic, well-located alternative to a trendy, big-name hotel. Society Cafe is the hotel's only restaurant, but the lobby serves from the carefully curated cocktail list as well. For health-conscious travelers, there's a 24-hour fitness center. There are no mega-suites, but select upgraded rooms on the second floor and the top floor feature furnished terraces for private outdoor lounging. If you splurge for the Walker Terrace on the top floor, you'll have spectacular views of the Empire State Building. The rooms aren't huge. For something more palatial at this price, you're barking up the wrong city. Did I mention there's a rotary phone next to the bed? Ah, the irony that this is a novelty. Greenwich Village is home to the artists of yesterday and the upscale restaurants of today, a ton of NYU kids and even more NYU buildings. The Walker Hotel is so centrally located that you can catch a train to almost anywhere in the city, but to keep things uber-local, stroll through Washington Square Park, browse new, used, and rare books at legendary , check out some Tibetan art at the , or catch some jazz at neighborhood staple. 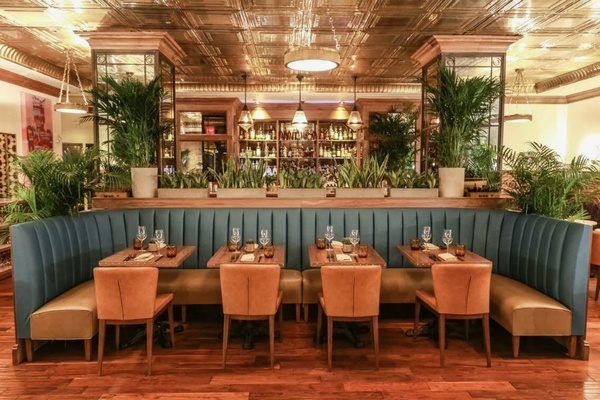 Hit-list of personal favorites: Danny Meyer's revamped and relocated , Mario Batali's classic high-end Italian enoteca , rustic farm-to-table Italian , not-just-for-vegetarians vegetarian hotspot , and wine powerhouse .